Well, no Wednesday lunch this week, it was hot lunch day. I like hot lunch day, little to no thinking on my part! 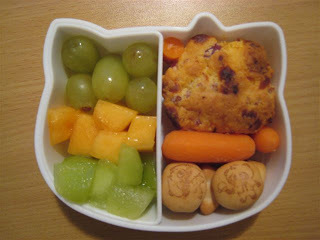 Today, she took assorted fruits (grapes, cantelop and honeydew), a ham & cheese muffin, some carrots and some panda cookies. I think this box is probably the best size for her. It holds more than it would appear but there are never leftovers either. Maybe we need another shaped one like this!